Concentrating on your core this year? You’re not alone. Toning this area of the body is a common fitness resolution, and the good news is that it doesn’t have to be boring (endless crunches, be gone!) and also can actually be accomplished pretty quickly. So whether you’re just looking to set an overall fitness goal for 2015 or you’re prepping for a beach vacation (lucky you! ), there are lots of ways to incorporate safe and inspiring exercise, as well as easy diet tips, into your life right now. 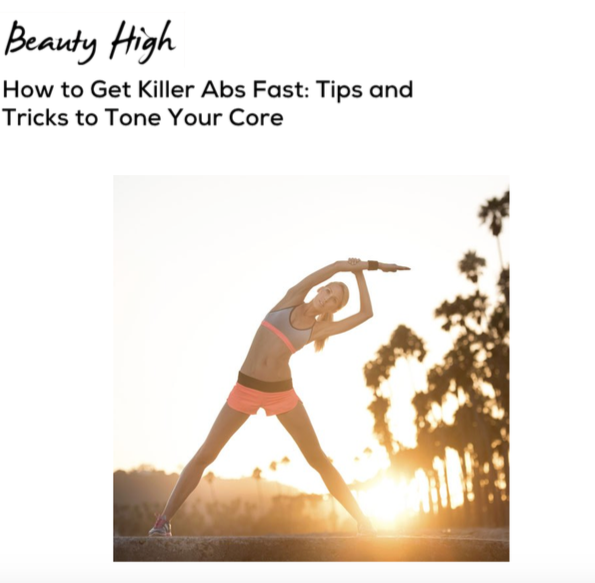 We caught up with Anna Kaiser, celebrity trainer and the founder of AKT In Motion, to get the scoop on how to tone those abs quickly and effectively. Kaiser—who works out with super toned celebs like Sarah Jessica Parker and Kelly Ripa—says one of the biggest mistakes people make when they’re trying to quickly tone their abs is going crazy with the crunches—an exercise that might end up hurting your back or neck. “We have to change the general mentality of an ‘effective ab workout’ from spot training to a full body burn for the best results. A series of jump squats will do more for your ab definition than 1000 crunches,” she explains. Instead, you might want to up your cardio, but don’t necessarily go running to your nearest spin class for ab salvation. Kaiser says High Intensity Interval Training is a better option, which includes plyometrics. “Try HIIT or interval cardio classes that require you to engage and challenge your core muscles during cardio portions,” she says. Looking for an addition to your crunch-less, fast-abs, workout routine? Try a plank. It’s hard not to break a sweat when you’re in this key position, as you’re engaging your core while holding your body-weight up in a strong, stable position. “There is absolutely no way you can perform a plank without recruiting your abdominal muscles,” explains Kaiser. To make sure this position doesn’t get stale or boring, Kaiser explains you can mix it up by modifying them with variations like the side-plank or planks with alternating tap outs. Don’t go into the gym with the mindset that you’re only going to pay attention to your abs, as Kaiser says it’s not possible to spot-train just one area. “It’s about shedding inches overall,” she says. Look for routines that work out your entire body. “The more you challenge your body overall, the faster you’ll see your definition improve,” she says. Believe it or not, Kaiser says what you eat is even more important than your workout regimen. If that’s not a reason to shape up your meal plan, we don’t know what is. She suggests cutting sugar, focusing on natural foods, veggies, foods with lots of protein and fiber, as well as drinking more water. Next Next post: AKTour: Ariel Hoffman’s Diary. Week 4.